Having a well developed vocabulary is the key to reading comprehension. The more words a person knows, the better he/she will understand the text. For English language learners (ELLs), vocabulary development is especially important. The average native English speaker enters kindergarten with a vocabulary of 5,000 words. The average ELL kindergartner may know 5,000 words in his or her native language, but very few words in English. Closing the gap can be a challenge for ELLs. Most ELL students quickly learn to communicate verbally with peers, but ELL students must also learn academic English. There are many Spanish English cognates that can help students learn academic English. Cognates are words in different languages that derived from the same original word or root. About 40% of all English words have similar cognates in Spanish. Family and familia, coast and costa, lion and léon are cognates. Most vocabulary words are learned from context. The more words you’re exposed to, the better vocabulary you will have. When reading, it is often possible to figure out the meaning of a new word from the context of the sentence or paragraph. With the use of iPads and eReaders, it is easy to look up unknown words. You only need to tap on the word to pull up its definition. In our series English Vocabulary for the Spanish Speaker,students get the necessary practice to increase their English vocabulary. 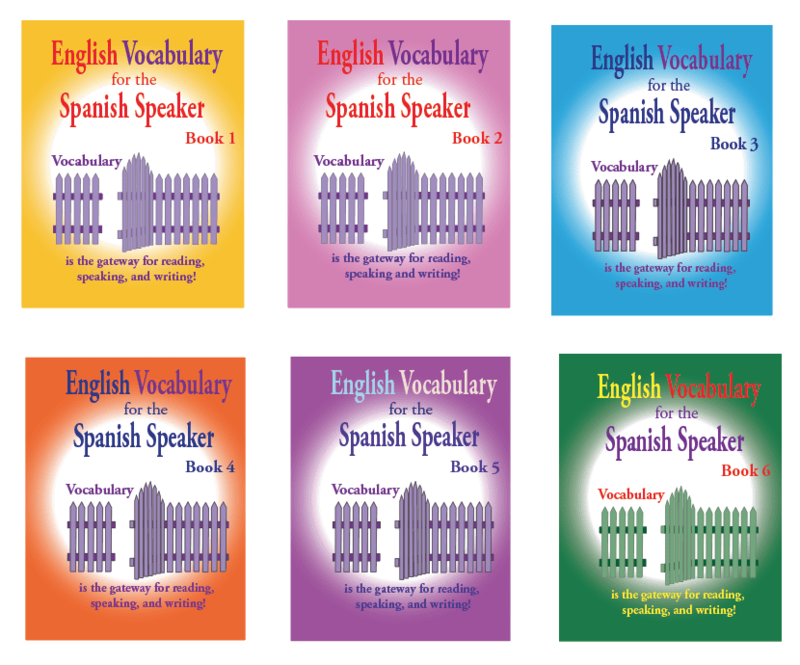 Many Spanish English cognates are presented in the six workbook series. English Vocabulary for the Spanish Speaker is part of Fisher Hill’s English literacy program for Spanish-speaking teens and adults. It reinforces the vocabulary presented in the other three series of the program: English Reading and Spelling for the Spanish Speaker, English Reading Comprehension for the Spanish Speaker and English Writing Composition for the Spanish Speaker. Vocabulary knowledge increases reading comprehension, writing proficiency and speaking skills. Visit our website at www.Fisher-Hill.com to learn more about our English Vocabulary for the Spanish Speaker series for Spanish-speaking teens and adults.